Mary Lee of Northfield, an abutter to the Northern Pass Transmission project, questions a panel of Eversource construction experts Thursday at adjudicative hearings before the Site Evaluation Committee. Hearings continue into August on the $1.6 billion, 192-mile project from the Canadian border to Deerfield. 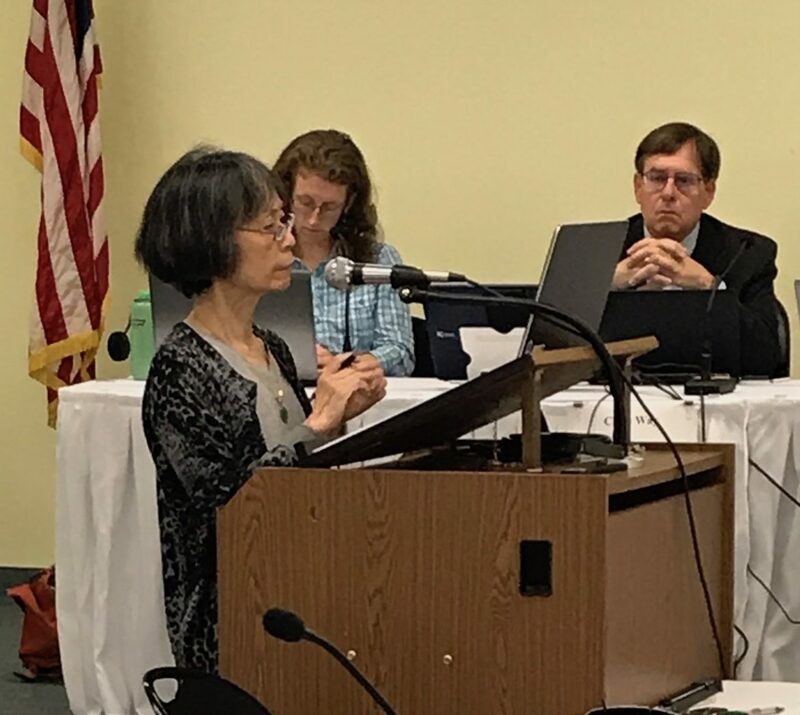 CONCORD — Construction work on the Northern Pass Transmission project through Concord will impact Karner blue butterfly habitat in the pine barrens, a project official testified Thursday. Project officials also said they have developed a mitigation plan to extend the habitat for the endangered species. The Karner blue has captured the attention of conservationists and Concord school children who helped make the Karner blue the state butterfly in 1992. Karner blue butterfly habitat protection was discussed Thursday at the Site Evaluation Committee’s adjudicative hearing on the $1.6 billion, high-voltage transmission line stretching from the Canadian border to Deerfield. Attorney Steve Judge, representing the owners of McKenna’s Purchase condominiums, asked if construction of the high-voltage transmission line would destroy Karner blue habitat in the area. Project manager Samuel Johnson said construction work in that right-of-way would impact some of the butterflies’ habitat. “We are aware where the Karner blue butterflies are and we have developed a mitigation plan,” Johnson said. Eversource Vice President of Engineering Kenneth Bowes said project officials do not identify the exact area because that is confidential to protect the butterfly restoration project. State and city wildlife officials have tried to protect the species that disappeared from the start in 1999 spurring a restoration effort that to date has produced a population of more than 2,000 butterflies. Officials say about 3,000 are needed to sustain the population. Murray said the mitigation plan was developed by working closely with New Hampshire Fish and Game and the U.S. Fish and Wildlife Service. In addition, he said, Eversource has previously agreed to vegetation management techniques that encourage the expanded growth of wild lupine habitat, which attracts the Karner blue. A Jan. 25 letter to the Concord Conservation Commission by Northern Pass agent Normandeau Associates said the project evaluated 21 parcels of land and visited several with agency experts before securing the 7-acre parcel suitable for the Karner blue butterfly. A right-of-way management plan for the pine barrens in Concord and Pembroke has been developed with state and federal input to protect the butterfly and other species living in the area, project officials said. “The NH Department of Environmental Services has accepted and incorporated our proposed mitigation plan for Karner blue impacts, including protection of a 6.9 acre parcel within the Concord Pine Barrens for Karner blue habitat, as a condition in its final report to the NH SEC,” Murray said. Officials also said Thursday they sent letters to every community along the 192-mile route seeking to discuss memorandum of understandings that could include such things as construction limitations and accommodations for specific situations in each community. Bowes said the request was sent in March to every community except Franklin, which already has a memorandum of understanding with the company. Numerous towns such as Franconia and Plymouth no longer respond to requests to meet, Bowes has said in previous testimony. The construction panel is expected to continue testifying Friday and then Julia Frayer of London Economics International LLC. Frayer, who produced a report on the project’s cost-benefit and local impact for Eversource, is expected to testify at some point Friday. The Site Evaluation Committee is expected to make a final decision on Northern Pass’ application in September and Eversource officials said it will take between two and three years to construct the project once the needed approvals are secured. The adjudicate hearings are expected to continue into August. InDepthNH.org’s recent coverage of the Northern Pass hearings. For older stories, see our comprehensive coverage on our Northern Pass page.